Friends of the Ventura River was founded in 1974 in response to a growing concern over impacts of poorly planned land-use and water developments and unregulated waste discharges within the Ventura River watershed. Dams, diversions, encroachment into the floodplain, removal of hillside vegetation for agricultural development, flood control activities, and the filling in of significant portions of the Ventura River Estuary have contributed to the loss of habitat, decline of native species, and degradation of recreational and aesthetic values that the Ventura River has historically provided Ventura County residents and visitors. In 1972 these threats culminated in the proposed extension of utilities, roads, and urban services across the Ventura River to support a planned freeway related commercial development on the western floodplain near the river’s mouth – the first proposed major urban expansion west of the Ventura River. The community’s united opposition to this leap-frog development catalyzed an interest not only in preventing further degradation of the Ventura River, but in reversing past impacts, and restoring the Ventura River as a defining natural community resource. The development of “The Ventura River Recreational Area and Fishery: A Preliminary Report and Proposal” by the Ventura County Fish and Game Commission in 1973 provided the first historical account of the Ventura River steelhead fishery, and a vision of what a restored river could once again contribute to the community. 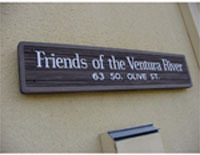 The formation of the Friends of the Ventura River was intended to provide an independent organized means of addressing the multitude of threats to the Ventura River and to actively promote the preservation and restoration of its natural resource, including its unique fish and wildlife resources, for the benefit of present and future generations. Since its inception the Friends have actively participated in a wide variety of planning and regulatory processes affecting the Ventura River watershed at the local, state, regional, and federal levels. It has also pursued and supported research of the botanical and fishery resources of the Ventura River, producing important studies of the Ventura River Estuary and the steelhead habitats of the Ventura River watershed. These reports have stimulated further scientific investigations which have contributed to the management of the rivers biological resources. Through active participation in land-use and water management programs the Friends, in collaboration with the Environmental Coalition and the Citizens to Preserve the Ojai, have helped shape local, state and federal plans, including the Ventura County General Plan, Ojai General Plan, City and County Local Coastal Plans, Regional Water Quality Control Board Santa Clara River Basin (4A) Plan, U.S. Bureau of Reclamation Ventura County Water Management Plan, and the Ventura River Trail Plan. The Friends contributed to the establishment of the U.S. Bureau of Reclamation’s Teague Memorial Watershed to protect the Lake Casitas water supply, and to both the Ventura River Preserve and Confluence Preserve which is now owned and managed by the Ojai Valley Land Conservancy. In 1999, with support from Patagonia and the Environmental Defense Center, the Friends organized the first multi-agency symposium to consider the removal of Matilija Dam. Over the past 35 years the Friends have also participated in a case-by-case review of countless land use decisions affecting the Ventura River. Some of the most notable include a the conversion the PetroChem plant to a gasoline cracking facility, a gypsum mine within the Los Padres National Forest, a golf course along the upper Ventura River, a mobile home park along San Antonio Creek, a recreational vehicle park near the mouth of the Ventura River, expansion of a rock quarry along the North Fork of Matilija Creek, and waste discharge requirements of the Ojai Valley Sanitary District Wastewater Treatment Plant. With the assistance of the Environmental Defense Center, the Friends have legally challenged major land use and water management decisions adversely affecting the Ventura River, including proposals to channelize San Antonio Creek, increase diversions from the mainstem of the Ventura River by the City of Ventura and the Casitas Municipal Water District, expand development of the Ventura County Fairgrounds and Emma Wood State Beach at the mouth of the Ventura River, and the initiation or expansion of gravel mining operations of the Southern Pacific Milling Company and others within the river. The Friends were also instrumental in getting the Tidewater goby (Eucyclogobius newberryi) and the Southern California steelhead (Oncorhynchus mykiss) listed as endangered under the U.S. Endangered Species Act in 1994 and 1997. These efforts have helped lay the foundation for all the work being done today by a wide variety of local, state and federal agencies, as well as other Non-Governmental Organizations such as the Surfrider Foundation, Matilija Coalition, California Trout, and the Ventura Hillside Conservancy, to restore the Ventura River watershed ecosystem. In 1994 Friends of the Ventura River celebrated its 20th anniversary with an historical retrospective of the steelhead fishery of the Ventura River, sponsored by Patagonia which has provided major financial support for the Friends efforts over the past three and half decades. Patagonia’s early support for Friends of the Ventura River is the origin of the Patagonia environmental grants program which now funds environmental organizations around the world.